Since Summer is apparently taking another break, today's post is suppose to mock all the dark and grey clouds up there in the sky. Get inspired by this summer-ish pastel look. 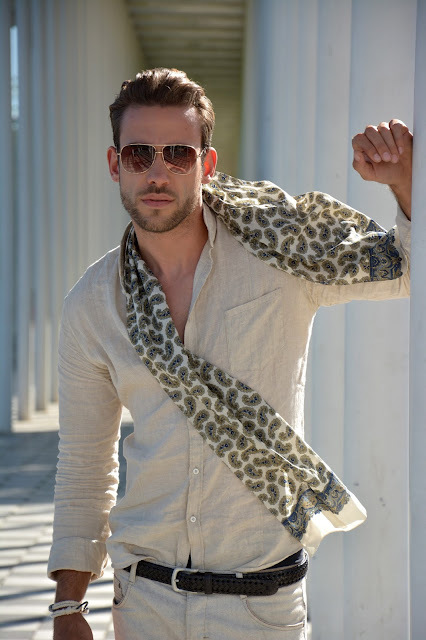 Pants and Shirt tone in tone combined with an outstanding light summer scarf, pilot glasses and matching accessory ... Ladies, what do you think? With our man showing up dressed like that I would say we are more than willing to let him take us to the one or other fancy restaurant at the seaside.... Enjoy your Thursday! Nachdem der Sommer allem Anschein nach mal wieder eine Pause einlegt soll der heutige Post dem grauen Himmel und den dichten Wolken ganz gekonnt trotzen. Man(n) nehme Hemd und Hose Ton in Ton in Pastell-Farben, einen auffallenden Sommerschal, Piloten Brille und passende Accessoires ... Ladies, ich denke wir sind mehr als bereit uns von unserem chic gekleideten Göttergatten ausführen zu lassen. Genießt euren Donnerstag!